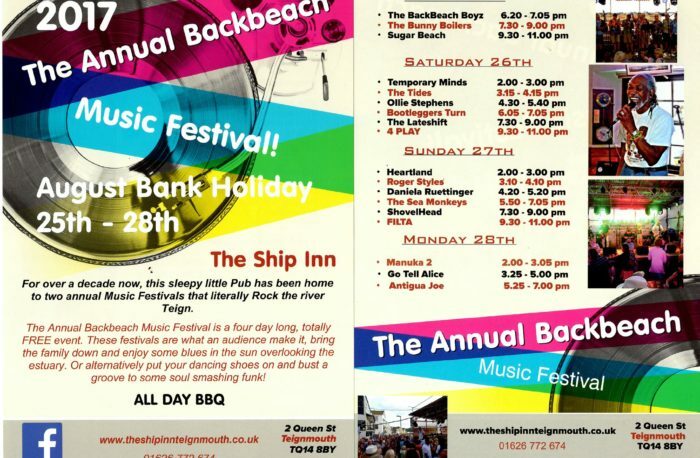 Head down to the Ship Inn in Teignmouth this August Bank Holiday weekend for their annual Backbeach Music Festival. Landlord Mike and his team are getting ready for a four day extravaganza from 25 to 28 August. The line-up includes The Backbeach Boyz, Sugar Beach, The Late Shift and Go Tell Alice. With great music, beer and food this family-friendly free event is not to be missed. For more information visit theshipinnteignmouth.co.uk or call 01626 772 674.